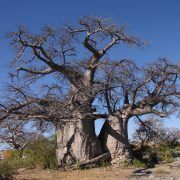 A stunning self-drive Botswana journey which will show you the most special areas of this Southern African country. 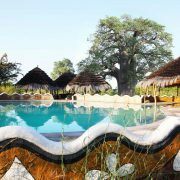 This Botswana journey is the most complete self-drive journey you can imagine, including Chobe National Park, Moremi Game Reserve, the Kalahari Desert (Central Kalahari Game Reserve), the vast Makgadikgadi Pan and remarkable Kubu Island. Also visit the fertile and verdant Okavango Delta. 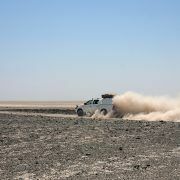 19 days of Africa trip are a purely self-drive 4×4 adventure with camping in the untamed wilds, animals in the camp, endless vistas, stunning sunsets and remarkable 4×4 routes. You can also sometimes stay in fixed B&Bs and/or lodge accommodations. Arrive in Kasane, Botswana, today. 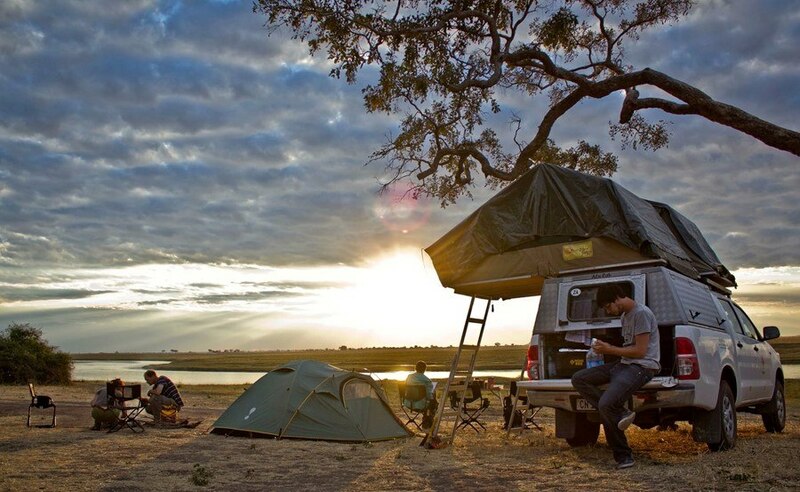 After picking up the 4×4, drive to the camp for your first night in Botswana. You can also go on a sunset cruise on Chobe River. Heading off to Camp Kwando through the Caprivi Strip. A beautiful green and watery area. Accommodation: camping. Travel distance: 250 km. The journey to Ngepi Camp (Bagani) on the Okavango River in the Okavango Delta’s Pan Handle crosses straight through the Caprivi Strip. 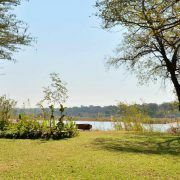 From Ngepi Camp you can visit the Popa Falls or make an excursion into the Okavango Delta. If you like simply relax a day in the camp. The second day at Ngepi Camp. 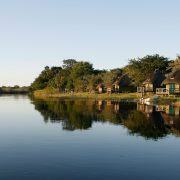 Go on a trip on the Kavango river (with Mekoro boat) or relaxt in the camp. 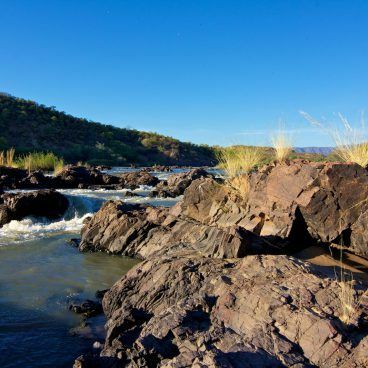 Visit Popa Falls you can take an excursion over the Kavango rivir (with Mekoro) or just relax in camp. From Ngepi Camo you can also visit the Popa Falls and the exciting Mahango NP. After your stay at Ngepi, you will move on to Maun today. You will arrive there in the afternoon, and you’ll have time to buy supplies and fuel. Accommodation: lodge. Travel distance: 310 km. Early in the morning you will have time to make a round flight above the Okavango Delta if you like: one of the most beautiful areas of Botswana. 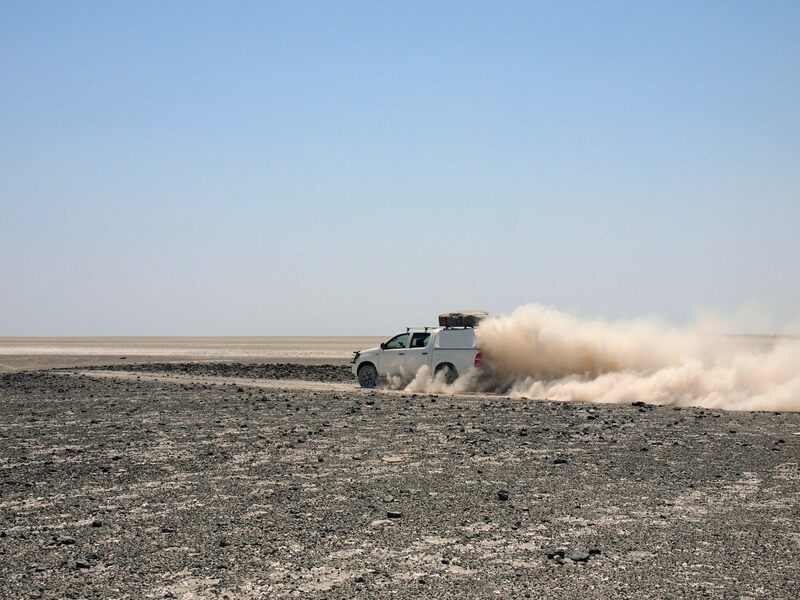 Then, you’ll continue your 4×4 trip east and the Makgadikgadi Pans National Park. 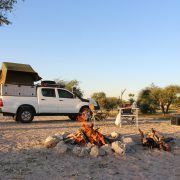 Camp for today Khumaga on the border of the Boteti river and the Makgadikgadi National Park. Accommodation: camping. Travel distance: 160 km. Time for a relaxed scenic drive in the park before heading off to Gweta. 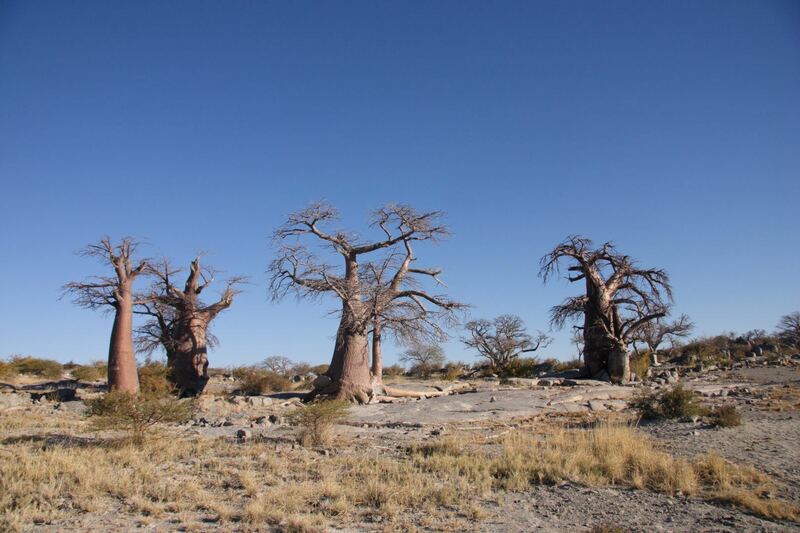 The little town of Gweta and the Planet Baobab camp at the edge of the Makgadikgadi Pans are the next destinations. On the way to Gweta it is also possible to make a detour into Nxai Pan National Park and visit Baines Baobabs. Today you’ll enjoy the beautiful trip to Kubu Island. You will cross the Nwetwe salt pan, and you’ll reach Kubu Island around lunch time. 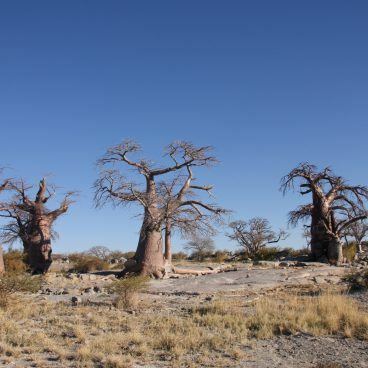 At the end of the dusty journey you will be rewarded with beautiful Kubu Island, a rocky island filled with stunning Baobab trees. The campsite is simple and located near the beach. You can discover Kubu Island on foot and enjoy the wide view and a beautiful sunset. 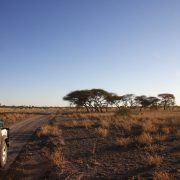 After Kubu Island, the trip will take you on a long day’s journey to Central Kalahari Game Reserve. We advise you to leave early in the morning. 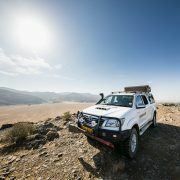 The journey will take you south across the salt pans and on to a level stretch of tarmac, which is a welcome change. 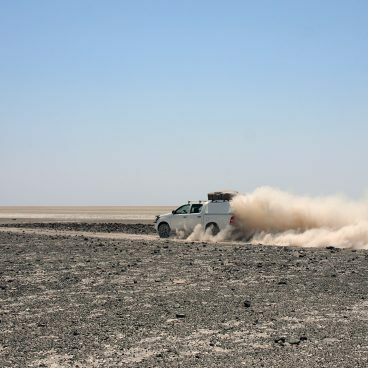 The turn-off to Central Kalahari Game Reserve is a dusty sand road. 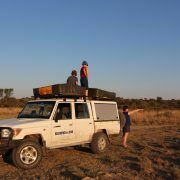 Upon arrival in the vast Kalahari Reserve, you will go on to the Sunday Pan. Accommodation: camping. Travel distance: 315 km. Two entire days for game drives in the Kalahari Desert. You can look for the Kalahari Lion with its dark manes, and you might see the rare brown hyenas. Jackals, Bat Eared Foxes and a Honey Badger are among the regular sights. Antelopes you’ll see are the Gemsbuck, with its long horns, and the Springbok. Both animals can survive in this arid desert area. Accommodation: camping. Travel distance: 40-200 km game drives. Today you will go to Motopi in the western part of the reserve. The drive to go there is one big game drive. After Central Kalahari, you’ll get back to civilisation on the journey to Maun. The first part of the journey will take you across dirt roads, while the second part consists of tarmac roads. You have the option of travelling by Kuke Fence. However, this is a longer route. In Maun it is possible to book a flight over the Okavango Delta. 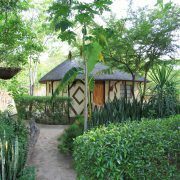 Accommodation: lodge. Travel distance: 200 km. In the morning, there’s time to buy supplies and Diesel in Maun. 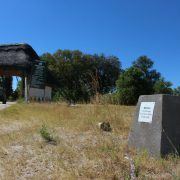 Then, your self-drive safari will take you through Moremi Game Reserve and the Third Bridge Camp. Third Bridge is at the edge of the Okavango Delta. 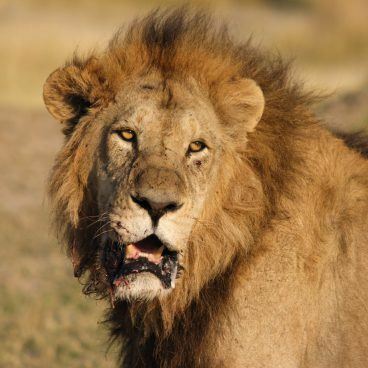 This day is perfect for game drives and spotting many safari animals that live in the Moremi Reserve. You have a good chance to spot lions, hyenas and leopards. Even elephants and antelopes. The camps in Botswana are not fenced, so various animals may visit the camp at night. 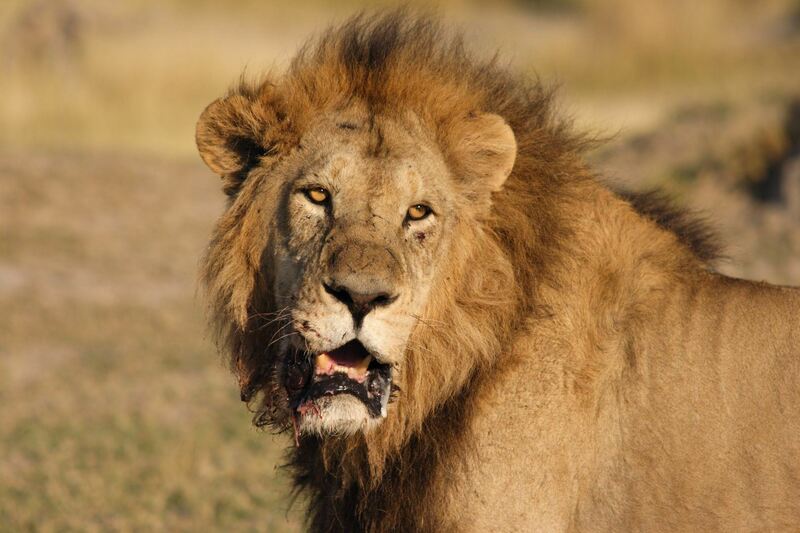 After the morning game drive you will go on through Moremi Game Reserve and the second camp, Khwai (North Gate). This day is also reserved for game drives and spotting the many safari animals living in the Moremi Reserve. In the afternoon, you will arrive at North Gate and the Khwai campsite. 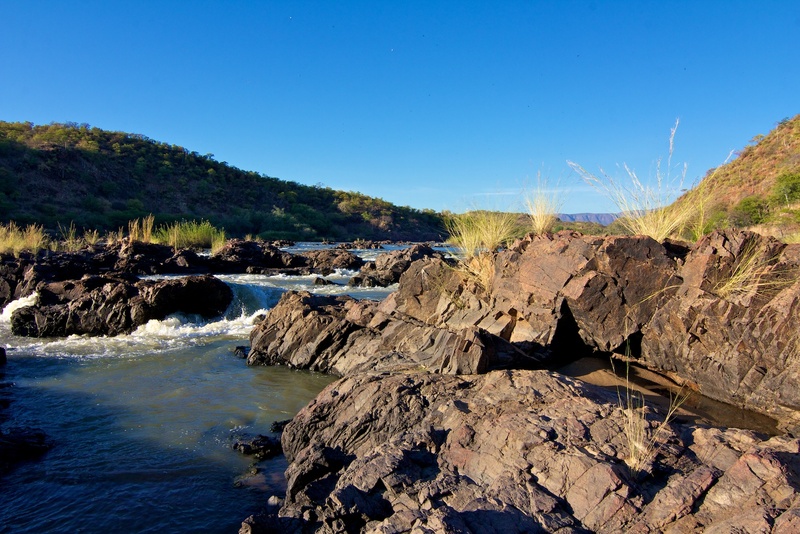 After setting up camp it’s time to relax and make an evening game drive along the Khwai River. 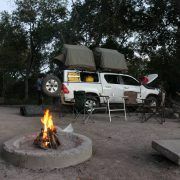 The 4×4 trip from Khwai in the Moremi Game Reserve to Chobe Savuti is one big game drive that will show you many animals. For any Botswana trip, it’s advisable to start early and go on another game drive around North Gate camp before you continue to Chobe National Park. 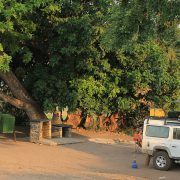 In the afternoon, you will arrive at the Savuti Campsite. 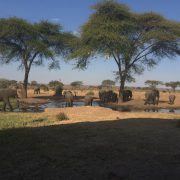 This part of Chobe is famous for its Bull Elephants and the Savuti Pride (pride of lions) living on the Savuti Marsh. The Savuti Channel running through the area to the Savuti Marsh was dry for many years, but it has seen running water the last few years. In the afternoon, there is plenty of time for an extensive game drive to discover this remarkable area of Botswana. 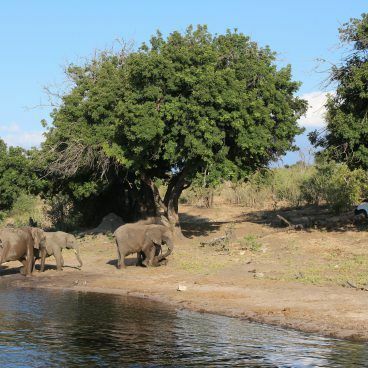 After Chobe National Park Savuti you’ll travel to the northern part of Chobe National Park. On the sandy tracks the 4×4 is indispensable. 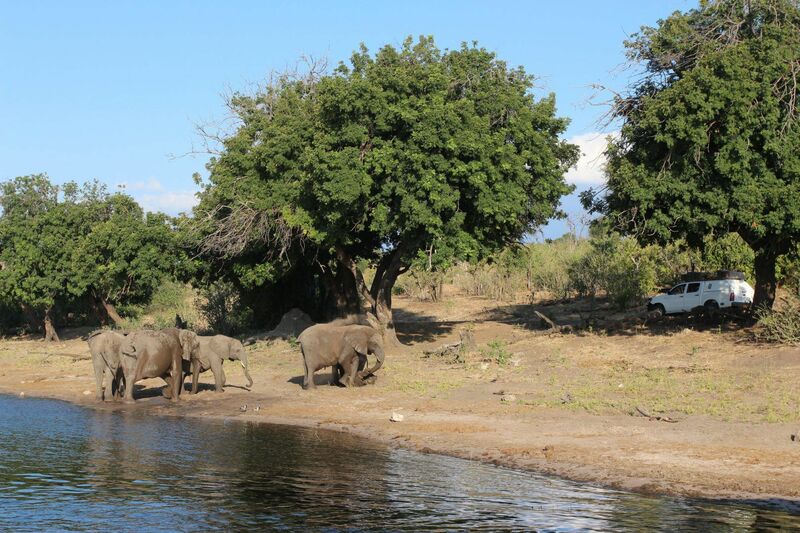 In the afternoon, you will arrive in Ihaha, at the Chobe River shore. 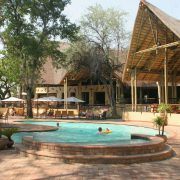 Today you will drive to the Chobe Safari Lodge. A short drive with early arrival in Kasane. You can use the afternoon to relax in Kasane. We recommend to go on the Chobe River Sunset cruise. Accommodation: camping. Travel distance to Victoria Falls: 160 km in total. The last full day in Botswana. You can take a day trip to the Victoria Falls in Zimbabwe or spend the entire day driving through Chobe National Park. The last day of your Botswana journey, after returning the 4×4 car, you will go on to your next destination. All self drive trips can be adjusted to your personal requirements. Staying somewhere for a day longer or adding another destination is not a problem. Ask us about the possibilities and we are happy to help you! Prices per person for various dates in 2019 and 2020. 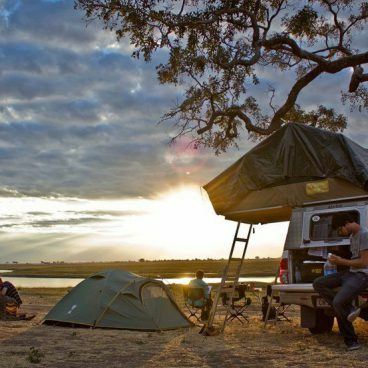 This Botswana Self Drive trip is available for 2 to 4 people per car. The default car is a Toyota Hilux 4×4 double cab 2.4 Diesel. The price for 5 people or more can be requested and depends on the local possibilities and space in the preferred car. 4×4 cars (Land Cruiser or e.g. 4×4 camper) other than the default 4×4 car are available upon request. Optional CDW (Zero Excess) insurance incl. tires and glass € 410,- per trip.